In today’s digital world, technology represents opportunities to connect with friends far away, learn in a ways we never did before, and so much more. However, there are dangers lurking behind these opportunities; everyone from children to adults is vulnerable to cyber bullying, online predators and identity fraud. Thankfully, it’s possible to minimize these risks, with careful guidance and cyber smarts. Your family lives online—it’s where you communicate with friends, organize vacations and more. Keep everyone safe, including yourself, with this important tips. Everyone can agree that social media is a blessing and a curse. The blessing: We can stay connected with friend and family from anywhere in the world. The curse: potentially dangerous people can learn about us and get in contact with us, even young kids or teenagers who are innocently using these social platforms. Recent research reveals that 88 percent of murders and 80 percent of rapes are committed by someone who knew the victim. 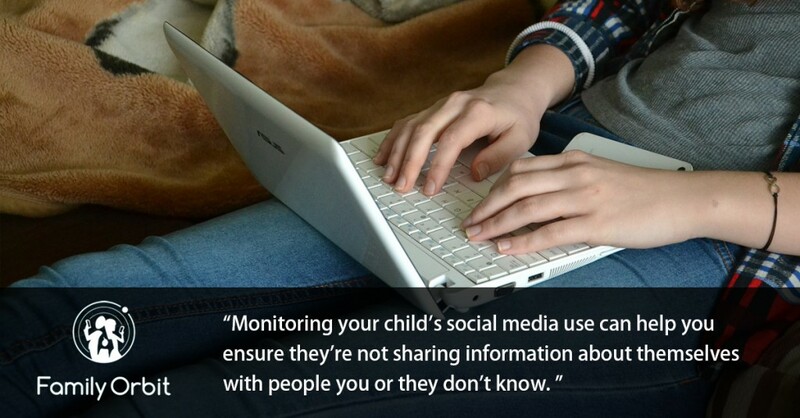 Monitoring your child’s social media use can help you ensure they’re not sharing information about themselves with people you or they don’t know. Request to be their friend on Facebook, follow them on Twitter and Instagram and monitor who is posting on their page and who they are direct messaging with. There are a variety of apps that allow you to get notified when new friend requests come in as well, which can be an even better way of keeping tabs on potentially suspicious people. Phishing, or fraudulent emails, URLs, and clickbait, affects thousands of people every year. The best way to prevent falling victim to a phishing scam is educating your family about what phishing looks like. Poor spelling and grammar, a request for personal information, and requests for money are all signs of a phishing scam, as are congratulatory emails for contests you’ve never entered. If it seems too good to be true, it probably is, and you and your children should be wary. A great rule of thumb for phishing is to simply not click/download/or open anything that seems suspicious. For example, if someone emails you asking to verify any type of account details through email, it’s probably not legitimate—no legitimate organization or business will ask for these details over email. Encourage your children to come to you if they have any questions about odd emails. Cyberbullying is defined as online communication of intimidating or threatening nature. This aggressive behavior is on the rise, with 25 percent of teenagers reporting that they experienced bullying via their cell phone or the Internet in 2014. Staying involved in your child’s life is the best way to combat cyberbullying. Limiting time spent online can be helpful as well as not allowing your child to be online by themselves (without another person in the room). Be sure to let your children know that anything said to them that makes them sad, uncomfortable or unhappy is not okay and that they should always come to you if this happens. If your child has become a victim of cyberbullying, there are things you can do to help. Head to CyberBullying.org for more information. Online filters block websites that have questionable content and check the history of what your child has been searching for on the Internet. There are a variety of tools you can use to do this; check out this list on FamilySafeComputers.org. With the software or app installed, it will be easier to ensure that spam or inappropriate content don’t bother your children. Still concerned about your family’s online safety? The best thing to do is talk to them. There are resources available to parents with age-appropriate fact sheets and conversation starters to open a dialogue about online safety with their kids. While you don’t want to make your children paranoid, it’s a conversation that could stop the worst from happening. While we spend most of our time online, there are still many dangers and ways to stay safe in the offline world that you need to be aware of. Stay safe with these tips. While walking and texting isn’t illegal, it can be dangerous. So much so that the Wall Street Journal published an article in February 2016 about it: “Emergency room visits involving distracted pedestrians using cellphones were up 124% in 2014 from 2010—and up 10-fold from 2006,” said author Geoffrey Fowler. The article also revealed a study that found we walk differently while on the phone, making us more likely to fall or walk into something, like a wall or a fountain. While multi-tasking is a regular part of your life, it’s not safe when it comes to texting and walking. In the end, just say “no”—put your phone on silent so you aren’t distracted by it while walking. Invest in a pair of wireless headphones if you neither you nor your kids can avoid talking on the phone while walking, Lower-priced options range from $32-$99, allowing you to get an inexpensive pair for your teenagers. This may help you be more aware, with both of your hands free and your phone in your pocket. If you’re in a place where you feel unsafe, your GPS can be what gives you piece of mind, and in the worst case scenario, keeps you safe. The most important part is doing the work up-front—downloading an app that you can set into action whenever necessary. When staying connected with your children, to ensure their safety, you could use the Family Orbit app, which allows you to do virtual check-ins and track people within your “circles” via location sharing. The built in messaging, coupled with GPS tracking, allows everyone to feel safe at any moment. Keeping yourself and your family safe is your number one priority, and with these tips you can do exactly that. Get the apps you need and give your children a tutorial on online safety to gain a peace of mind you never had before. Jessica Thiefels has been writing for more than 10 years. She is currently a lifestyle blogger and the editor of Whooo’s Reading and Carpe Daily. She’s been featured on PBS.org, Home.com and FamilyEducation.com. When she's not writing or editing, she's trying new DIY projects around the house or training fitness clients.